In this long-overdue book, Dr. Brian Russell exposes the complaints that have the most destructive effects on Americans and, by extension, on America today. First, he helps us understand the damage we have done to ourselves, our relationships, kids, careers, and our country by misunderstanding what “the pursuit of happiness” really means, failing to differentiate wants from needs, and externalizing blame for our own failures. 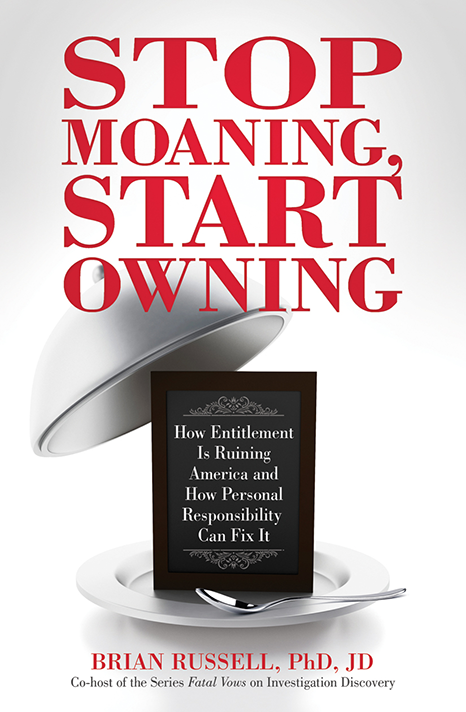 In the second part he explains how we got so off-track, leading to an “Age of Entitlement,” and the “saving grace” that calls us back to personal responsibility. He then reveals how so many of us have abdicated personal responsibility and, consequently, power over our lives. Finally, we learn how to engage in transformative change by embracing and encouraging personal accountability and responsibility. Dr. Russell empowers us to reassert control over our individual and collective destinies and teaches us how to leverage the transformative power of life’s “perspective-preserver”: gratitude—Amazon.com. Watch Dr. Brian talk about the book with Dr. Mary Davidson. Join Dr. Brian’s email list to receive notifications of TV/radio appearances, personal appearances, publications, and more!